1Department of Forestry and Wildlife Management, University of Port Harcourt, Port Harcourt. Nigeria. 2Department of Forest Resources Management, University of Ibadan, Ibadan. Nigeria. 3Department of Pharmacognosy, University of Ibadan, Ibadan. Nigeria. The genus Khaya is extractives rich, but the extractives in the stem bark are among the most abundant, accessible and utilised materials in Nigeria. These extractives are of considerable interest for wood protection because of their pesticidal properties. In this study, the chemical constituents of Khaya ivorensis stem bark and their termiticidal activity were investigated on Triplochiton scleroxylon and Vitex doniana woods. Spectrophoto-metric and Forlin-Ciocalteu analyses showed that Khaya ivorensis stem bark contained total: alkaloids 38,98±0,02 mg/g, flavonoids 0,37±0,02 mg/g, phenol 50,62±0,11 mg/g, saponins 156,31±0,76 mg/g, and tannins 59,95±0,54 mg/g. Field tests demonstrated that the extract from Khaya ivorensis stem bark had significant termiticidal activity at tested concentrations compared to the control. The results indicated that Khaya ivorensis stem bark has potential as a natural agent for termite control. The genus Khaya (Family: Meliaceae) is rich in extractives throughout the plant, but these extractives are primarily concentrated in the stem bark (Olayinka et al.1992, Iwu 1993). These extractives are of considerable interest for wood protection because of their indigenously known pesticidal properties (Ademola et al. 2004, Agbedahunsi et al. 2004). Khaya ivorensis (Oganwo, Yoruba Nigeria) and its congeners have a long traditional history of pesticidal uses including control of human intestinal roundworm infestations (antihelminths) (Stephen et al. 2009, Lawal et al. 2010, Olusola and Oyeleke 2015) and protective activities against skin diseases usually caused by fungi and bacteria (Olusola and Oyeleke 2015, Adedeji 2016). They have also been used to protect stored cassava/yam chips against pests (Babajide et al. 2007, Loko et al. 2013). Leaf extracts from K. ivorensis showed excellent antifungal activities against stored foods spoilage fungi (Babajide et al. 2008, Oladimeji et al. 2013). The root has been reported to cure sexually transmitted diseases (Kayode et al. 2009). Limonoids isolated from K. senegalensis fruits, and seed oil exhibited strong biological activity against the plant pathogenic fungus Botrytis cinerea Pers (Abdelgaleil et al. 2004) and cattle ticks (Boophilus decoloratus) (Choudhury and Boshe 2013). Specifically, limonoids from K. ivorensis seed/fruit and stem bark exerted antifeeding, antifungal, antibacterial, antitrypanosomal and antitumor activities (Vanucci et al. 1992, Abdelgaleil and El-Aswad 2005, Abdelgaleil et al. 2005, Zhang et al. 2009, Ji et al. 2014). Ewete and Bamigbola (1998) reported that a crude extract of K. ivorensis stem bark at 500-1000ppm significantly reduced Callosobruchuchus maculatus emergence on Bambara groundnut own several generations. However, very little is known about the pesticidal activity of K. ivorensis against wood-degrading agents. 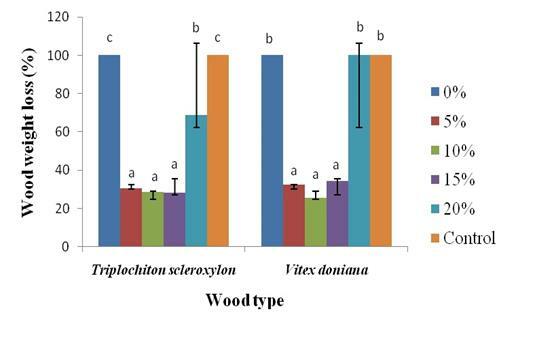 In this study, the chemical composition of K. ivorensis stem bark extractives was quantified and termiticidal activity on Triplochiton scleroxylon and Vitex doniana wood test blocks was investigated under field conditions. Concentrations of alkaloids, flavonoids, phenol, saponins and tannins in the KISB extract were quantitatively analysed by using Spectrophoto-metric and Forlin-Ciocalteu methods (Hiai et al. 1976, Padmaja 1989, Singh et al. 2004, Chan et al. 2007, Kale et al. 2010). All the quantifications were performed in duplicate and presented as mean values (n = 2) ± Standard Deviation (SD) in mg/g. Briefly, 25 mL of methanol was added to 0,5 g of sample contained in a covered 50 mL centrifuge tube which was shaken continuously for 1 hour at room temperature (Chan et al. 2007). The mixture was centrifuged at 3000 rpm for 10 min, and then the supernatant was collected and stored at -20oC until the analysis was done. The total alkaloid contents in the samples were measured using the 1, 10-phenanthroline method described by Singh et al. (2004) with slight modifications. A 100 mg sample powder was extracted in 10 mL of 80% ethanol. This was centrifuged at 5000 rpm for 10 min. The supernatant was collected and used for further estimation of total alkaloids. The reaction mixture contained 1 mL plant extract, 1 mL of 0,025M FeCl3 in 0,5M HCl and 1 mL of 0,05M of 1, 10-phenanthroline in ethanol. The mixture was incubated for 30 minutes in a hot water bath at 70±2oC. Absorbance of the red coloured complex was measured at 510 nm against a reagent blank. Alkaloid contents were estimated against a standard curve of qui-nine (0,1 mg/mL, 10 mg dissolved in 10 mL ethanol and diluted to 100 mL with distilled water). The values were expressed as g.100g-1of dry weight. TFC was determined by the aluminium chloride method as reported by Kale et al. (2010). A sample (0,5 mL) of the extract was dispensed into a test tube along with 1,5 mL of methanol 0,1 mL of aluminium chloride (10%) 0,1 mL of 1M potassium acetate and 2,8 mL of distilled water. The reaction mixture was mixed and allowed to stand at room temperature for 30 minutes before absorbance was read at 514 nm. TFC was expressed as quercetin equivalent (QE) in mg/g material. The total phenolic content of the extracts was determined according to the Folin-Ciocalteu method (Chan et al. 2007). Briefly, 300 μL of extract was dispensed into a test tube (in triplicates) along with 1,5 mL of Folin-Ciocalteu reagent (diluted 10 times with distilled water), followed by 1,2 mL of Na2CO3 solution (7,5w/v). The reaction mixture was mixed and allowed to stand for 30 min at room temperature before the absorbance was measured at 765 nm against a blank prepared by dispensing 300 μL of distilled instead of sample extract. TPC was expressed as Gallic acid equivalent (GAE) in mg/g material. Total saponins (TS) were determined using a modification of the method of Hiai et al. (1976) as described by Makkar et al. (2007). The sample (0,5 g) was extracted with 25 mL of 80% aqueous methanol on a mechanical shaker for 2 hour, after which the contents of the tubes were centrifuged for 10 min at 3000 rpm. An aliquot (0,25 mL) of the supernatant was added to 0,25 mL vanillin reagent (8% vanillin in ethanol) and 2,5 mL of 72% aqueous H2SO4 in a test tube. The reaction mixtures were heated in a water bath at 60 °C for 10 min. The tubes were cooled on ice for 4 min and then acclimatized to room temperature. Absorbance was measured in a Uv/Visible spectrophotometer at 544 nm. Diosgenin was used as a standard and the results obtained were expressed as mg diosgenin equivalent per g of sample dry matter. Tannin content of samples was determined according to the method of Padmaja (1989). Sample (0,1 g) was extracted with 5 mL of acidified methanol (1% HCl in methanol) at room temperature for 15 minutes. The mixture was centrifuged at 3000 rpm for 20 minutes 0,1 mL of the supernatant was added to 7,5 mL of distilled water 0,5 mL of Folin-Denis reagent, 1 mL of 35% sodium carbonate solution and diluted to 10 ml with distilled water. The mixture was shaken well, kept at room temperature for 30 min and absorbance was measured at 760 nm. A blank was prepared with water instead of the extract. Tannin content was expressed as tannic acid equivalent (TAE) in mg/g material. Small wood samples (2 cm x 2 cm x 6 cm) were processed from unblemished 22 year old Triplochiton scleroxylon and 28 year old Vitex doniana trees’ bolts. Wood samples were oven dried at 103 ± 2 °C to constant weight (ASTM D-1413-2007) and weighed (W0). The samples were then kept in air-tight bags prior to use. Thereby mix samples of each wood species containing mixtures of sapwood and heartwood were selected for tests. The extract was diluted in 1 L of 70% ethanol to 5%, 10%, 15%, and 20% of (26,7g or 5,3% yield) along with solvent alone and a control was included. The oven dried wood samples (18 replicates) were then soaked in their respective formulations for 3 days. Then weight gain (W2) was used to calculate the net absorption and retention. Termite resistance of the treated and untreated wood samples was evaluated according to procedures used by Lenz et al. (2003), Lenz et al. (2011), Asamoah et al. (2014). The termite field test was carried out at Latitude 7o 44' 29" and 7o 44' 31" N and Longitude 3o 89' 75" and 3o 89' 77" E within the University of Ibadan, Nigeria. The area is a humid agro-ecological zone (Ajayi et al. 2012) and is known to be perennially infested with variety of termites. The area experiences high relative humidity and generally two rainfall maxima regimes during the rainfall period of March to October with an average of 1230 mm per annum. The mean annual temperatures range between 22oC and 31oC and relative humidity ranges between 57% and 99% (Oshunsanya 2013). The soil type is an Alfsol formed from the basement complex rocks (Oshunsanya 2013). Termite’s infestation in the area was very severe, essentially subterranean types (such as Amitermes evuncifer, Macrotermes bellicosus, and Odontotermes spp (Adedeji 2016) which have variable foraging specificity ranging from damp to dry woods. From eighteen treated blocks each of T. scleroxylon (TS) and V. doniana (VD) samples per treatment, six replicates were used. The TS and VD samples treated with the same extract concentration were placed side by side horizontally and buried on the topsoil level spaced at 1 m apart from each different treatment wood blocks. After six months, the test samples were carefully exhumed from the field, renumbered, scrubbed and washed to remove all the soil particles, dried at room temperature and finally oven dried for 22 hours at 103±2oC. From the oven dry weight after the treatment and final oven-dried weight after the field test, the weight loss % and termiticidal activity of the formulations were calculated with the reference to the control samples using the standard formula (Equation 2). W3 = is the oven dry weight after attack test. Data from the experiments were analysed using analysis of variance (ANOVA) and Least Significant Difference (LSD) at p < 0,05. All results were expressed as means ± Standard Deviation (SD). Khaya ivorensis stem bark extract (5,33±0,02%) was obtained as very fine glassy/shinning reddish-brown pellets. Phytochemicals, including phenolic content are known to influence the rate of wood degradation by termites (Syofuna et al. 2012, Kadir 2017). The extracts contained appreciable amounts of: saponins (156,31±0,76 mg/g), tannins (59,95±0,54 mg/g), phenol (50,62±0,11 mg/g), alkaloids (38,98±0,02 mg/g), and flavonoids (0,37±0,02 mg/g). KISB extract yield was much lower than 13% obtained using hot water (Tepongning et al. 2011, Tepongning et al. 2013) in Cameroon. High extract yields were also obtained from K. senegalensis leave with methanol (20,5%) or aqueous extraction (17,4%) in Sudan (Satti and Elamin 2012). This variability may reflect the variability in solvents used and potential the moisture levels at which the yields were determined. The glassy/shining appearance of the extract suggested that KISB might contain silica. The KISB extract colour correlated well with the previous studied (Taiwo and Ogunbodede 1995, Falodun et al. 2009, Stephen et al. 2009, Tepongning et al. 2011). Chemical analyses showed with total saponins content being most copious. Previously, many studies on K. ivorensis chemicals have been documented (Adesogan and Taylor 1970, Adesida et al. 1971, Taylor 1977, Vanucci et al. 1992, Abdelgaleil et al. 2005, Zhang et al. 2009, Ji et al. 2014). These studies were however focused on specific compounds mainly limonoids. Taiwo and Ogunbodede (1995) documented an increasing extractable tannin (%) contents from reducing K. ivorensis bark ground particle sizes for development of adhesives. Recently, Adeyemi et al. (2014) qualitatively documented among others, the presence of saponins, tannins and flavonoids in K. ivorensis stem bark. The highest total amounts of saponins found in this study agreed with the findings of Ejikeme et al. (2014) that K. ivorensis wood heavily contained saponins. While plants produce varying chemical compounds as part of their normal routine metabolic activities, the high quantities of total saponins ˃ tannins ˃ phenol ˃ alkaloids contents found in this study confirmed the extractives richness of KISB. The two tropical test wood species showed no significant variability at the level of treatability in terms of KISB extractives uptake (absorption) and retention (Table 1). VD absorbed and retained extractives more than TS wood samples. The slight differences were likely the variations in chemical composition, cell wall organisation and density (Khazaei 2008). Previous studies have documented absorption of 24,9 kg/m3 (Omole and Onilude 2000) 54,86 - 64,90 kg/m3 (Olajuyigbe et al. 2010) 70,37 - 117,13 kg/m3 (Ogunsanwo and Adedeji 2010) and 190,1 - 206,8 kg/m3 (Emerhi et al. 2015) for T. scleroxylon wood. Table 1: Means comparison for treatability of woods with extract formulations. Termiticidal activity of KISB extract formulations against field termites on treated and untreated two wood species test samples was assessed and their effectiveness was quantitatively evaluated by the corresponding wood weight loss (WWL) values as presented in Table 2 and Figure 1. In line with the global trend of going back to nature, this study evaluated termiticidal activity of KISB crude extract using established below-ground contact approach on TS and VD woods. Generally, VD wood was more heavily attacked than TS wood while blocks treated with 10%, 15% and 5% concentrations of the extract showed moderate effectiveness (27%-31,5% wood weight loss (WWL)) according BS EN 252 2014 (Table 3) compared to 84,4% WWL for 20% concentration and 100% WWL for both controls. The significant interaction effect showed the severity levels of WWL among the formulations (Figure 1) but 15%, 10%, and 5% indicated moderately effectiveness on both test wood species. The percentage mean WWL (ranges of 27 % to 31,5%) for 15%, 10% and 5% were reflections of remarkably moderate termiticidal activity and such indicated better protection of wood against termites than 54,5% saving (45,5% weight loss) of stored Sorghum grains treated Khaya senegalensis leaf extract against beetles (Trogoderma granarium) reported in Sudan (Satti and Elamin 2012). This termiticidal property agreed with the reported biological activity of K. ivorensis stem bark at 250-1000 ppm against Bambara groundnut weevil, Callosobruchus maculatus (Ewete and Bamigbola 1998). This trend of termiticidal result has a promising conservation implication as little will effect better protection. Amitermes evuncifer, Macrotermes bellicosus, and Odontotermes spp. were the common termites species identified in the study area. However, Amitermes evuncifer was found to be the dominant species degrading the testing blocks under the soil. Termites’ attacks were negligible in some but the high numbers of the test blocks were attacked by some soil-inhabiting fungi notable one being strand-forming, like Coniophora olivacea fungus. The additional WWL caused by fungi was likely occasioned by early downpour of rainfall (precipitation) between February and April in the year 2014. Table 2: Main effect comparison for wood weight loss caused by termites. Figure 1: Termiticidal activity of K. ivorensis stem bark extractives. Means with the same letter for a wood species are not significantly different from each other at α = 0,05. Table 3: Termite attack protective rating classifications according to BS EN 252 2014. K. ivorensis is an indigenous but suitable plantation species whose stem bark traditionally finds continuous medicinal uses for varying conditions. In this study, termiticidal profile of KISB against underground feeding termites was investigated on woods. The phytochemicals’ quantities were in the order of total: saponins ˃ tannins ˃ phenol ˃ alkaloids ˃ flavonoids content. KISB demonstrated moderately effective termiticidal activity in particular 5%, 10% and 15% concentrations (formulations) according to BS EN 252 2014 standard specifications. It was therefore concluded that higher formulations above 15% concentration may not offer protection against termites, hence further biological studies using smaller quantity of KISB extract for indoor termites or laboratory tests are recommended. Authors are thankful to International Tropical Timber Organization (ITTO) for financial support through fellowship 009/12S awarded to Gabriel Adetoye Adedeji (GAA). Authors are also thankful to those who contributed to the completion of this work.